The Manfrotto Neoprene Adapter with Chestnut Pro Strap from Camdapter provides a strong and functional hand strap system that can be used with a camera, neck strap and tripod - all at the same time. This Adapter is recommended for cameras that do not have a rubber base around the tripod thread and that fit all cameras and tripod heads that use the Manfrotto 3157N camera plate (200PL in Europe) or the RC2-type QR adapters. The Adapter is manufactured from rugged black anodized aluminum and contains an anti-slip, cloth-finished neoprene insert that adds an important anti-twist feature to the system. Once attached, the plate stays put and won't slip around like various camera flash brackets that skew and that you always find yourself readjusting. The Adapter plate screws into your tripod socket and has a 1/4-20 tripod thread on the bottom so you'll always be able to attach your camera to a tripod without removing the strap - a real benefit when the shot calls for added stability or a slow shutter speed. The Adapter also has double strap lugs that permit you to use the Pro Strap as well as a neck strap. This assures a double layer of protection against any possible slippage. The Adapter is extremely lightweight at 1.8 oz (51 g) even with all its pins and screws. 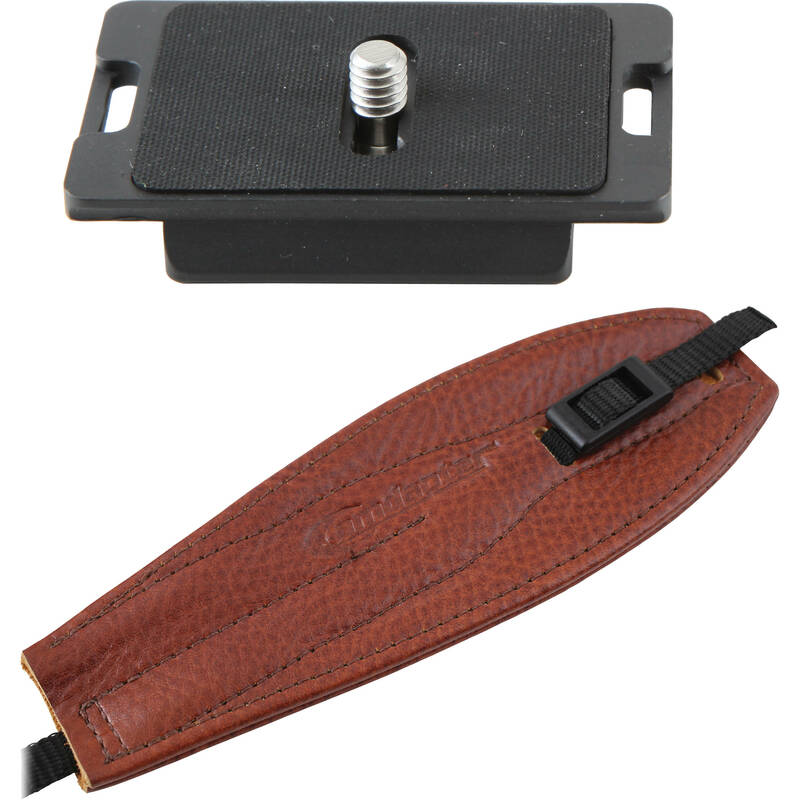 Box Dimensions (LxWxH) 2.9 x 2.8 x 1.4"
Manfrotto Neoprene Adapter with Chestnut Pro Strap is rated 3.7 out of 5 by 6. Rated 2 out of 5 by ike from not well designed... i finally opened the package yesterday (05/20) 3-1/2 weeks after after receiving it (arrived 04/24). the installation wasn't difficult. it came with an allen wrench that was needed to attach the plate to the bottom of the camera. the quality of the components is acceptable, even if the construction of the plate itself dosn't match the build of other manfrotto plates i own. i'm disappointed with the design! it's not easy for my fingers to reach for the controls of my canon EOS 50D. after loosening the strap, it felt like the camera would slip off my hand. i'm considering returning this and paying an extra $17.00 for a hand grip made by nikon. Rated 4 out of 5 by Sellerguy from Manfrotto Neoprene Adapter I use this product on my Canon 7D. It was very easy to install, and does what it was advertised as doing. It is very sturdy and of high quality, as you would expect from any Manfrotto product. Installation was fairly easy and straightforward. It just screws into the tripod mount and uses one of the neck strap loops for the other end. I thought it would perhaps get in the way of the memory card slot, but that hasn't been an issue. The only one complaint I have about the product is that it doesn't have a quick release option so I can replace it with the neck strap when I am out and about. Great product, though, if you are not going to be walking or carrying your camera. Rated 5 out of 5 by LarryPish from Camdapter I have these Camdapter straps with the Manfrotto adapter plates on all of my cameras; Canon 7D, 30D, 60d, etc. they are indispensable! The camera becomes part of my hand and is helping to reduce carpel tunnel syndrome developed from years of squeezing to hold the camera all day long. I have the Manfrotto quick-release female plates on my tripods and flash brackets, making it so fast and easy to change cameras back and forth while shooting weddings and other events. I use these every day all day long with all my cameras, and have become dependent on it. My hand does not hurt any more trying to hold the camera for hours at a time. Yes, I can access the battery door on these cameras with the Camdapter. Rated 5 out of 5 by Victor from Highly recommended I prefer hand strap over original neck strap. Very important if you shoot in crowded tourist areas. That's why I bought two straps for both my D750s. They work very well: secure hand grip and allow to put camera instantly on monopod/tripod (I'm fan of Manfrotto RC2 system). Beside that, the plate has a standard 1/4-20 threaded hole which I use to hang camera on the harness. Rated 5 out of 5 by bmward from Nice Product I use this with my Nikon D800 and Manfrotto tripod. It works great and is a very high quality product. The screw for the didn't fit when it arrived for attaching to my camera. I contacted the product maker directly who immediately mailed me another, which worked perfect. Love this product. Rated 1 out of 5 by DOMINICK from NOT FOR STANDARD BODY DSLR I sensed that the bottom metal ring adjuster has the potential to scratch the cam body. It make it harder to just grab the camera.